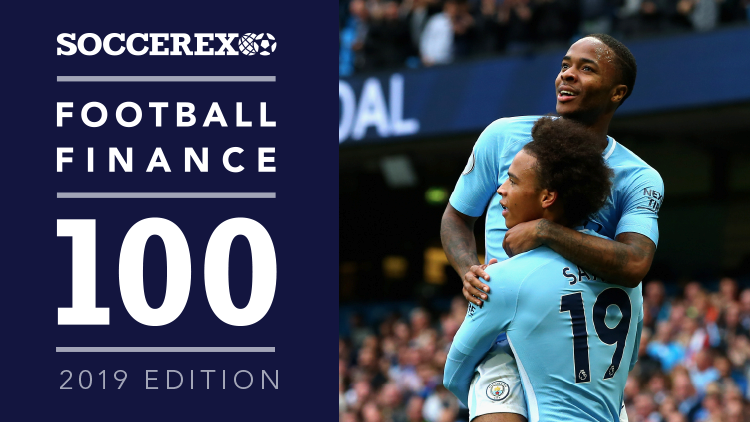 MANCHESTER CITY is the world’s most powerful football club in terms of financial clout, according to the latest Soccerex Football Finance 100 report. Game of the People was involved in the creation of this paper for the second successive year, providing editorial support to Soccerex. The FF100 confirms that the irresistible reach of football continues to embrace all corners of the world, further expanding the influence and diversity of the game, with international investment creating new contenders in what has become an all-consuming global marketplace. The Soccerex study demonstrates that wealthy ownership provides significant advantages, as evidenced at clubs like Manchester City and Paris Saint-Germain, but also that prudent financial management as seen at Tottenham Hotspur and Arsenal, provides the bedrock on which a stable club can be built. The game attracts owners from a broad demographic – the top 100 club owners come from 20 different nations and are evenly split across Asia, Europe and the Americas. Africa has just one representative. Furthermore, of the current top 100, 30% of owners come from either China or the United States. China’s foray into western football has seen investments in the UK, Spain, Italy and France, among others, but there can be no guarantee this momentum will continue given the influence the Chinese government has on football. The US is also a prominent investor in very influential and powerful clubs, and in the UK, Manchester United, Arsenal and Liverpool are all US-owned. Of the top 30 ranked clubs there are as many US owned clubs as there owned by France, Germany and Italy combined. In the FF100, 20% of the clubs featured are from the US and China, but they are yet to compete at the highest level with Europe’s big names. The top clubs in these two markets benefit from significant wealth ownership and hugely valuable tangible assets. Where they lag behind the Europeans is in the value of their playing assets. However, in both countries, there are restrictions on transfer activity, hence the markets are still in an early stage of their development. In China, there is a 100% tax on foreign transfer that has curbed investment in players, while in the US there is a salary cap and a central player ownership system. While China’s footballing evolution, given the government’s role in encouraging its development, may be dependent, to a certain degree, on the shape of the Chinese economy in the future, North America can look forward to the World Cup 2026 and the tri-party hosting that will involve the US, Canada and Mexico. The latter is often seen as a league ripe for international exposure and the FF100 includes nine clubs from Liga MX, more than the so-called big five European leagues of France, Germany, Spain and Italy. Clubs like Monterrey (EUR 26 billion), America (EUR 10 billion) and Tigres (EUR 7 billion) all have wealthy owners to call upon, as well as very healthy crowd potential. Europe, predictably given the maturity of the major leagues and international club competitions, continues to dominate the FF100, the English Premier League dominates the upper echelons, with 10 clubs in the top 30 – boosted by lucrative broadcasting deals and high levels of foreign investment – nine of the top 10 Premier clubs have foreign owners. Overall, 59% of the FF100 clubs are European and 40% come from the “big five” leagues. Europe’s major clubs are not just compelling investment cases, they also have the most “pulling power” with spectators and customers. In the FF100, only 16 clubs can attract average crowds of over 50,000 and they’re all from Europe. Unsurprisingly, European clubs benefit from high squad values and the only two with playing resources valued above EUR 1billion are Barcelona (EUR 1.1 billion) and Manchester City (EUR 1.1 billion). This is not only a reflection of the underlying wealth of the respective clubs, but also indicates their commitment to player development and transfer market appetite. The rest of the top 10 clubs are not far behind and clubs such as PSG and Liverpool who have shown a propensity to invest heavily in playing resources and who boast high value playing assets with huge potential for growth will surely soon reach the EUR 1billion mark soon. Squad value, to a certain degree, illustrates some of the imbalances across Europe’s major leagues. For example, Paris Saint-Germain’s squad valuation totals EUR 820 million, while the club’s nearest challenger in the FF100 is Lyon with a valuation of less than EUR 400 million. Similarly, in Germany, Bayern Munich’s squad comes in at over EUR 800 million, more than double the total of Borussia Dortmund. The margins between the top-ranked club and challengers are less pronounced in Italy and England, but Spain’s top three (Barcelona, Real Madrid and Atletico Madrid) are some distance from the rest of La Liga. Europe also leads the way in terms of tangible assets, not surprising given the number of new stadiums being developed. English clubs are at the forefront here with Tottenham, who have a new stadium nearing completion (EUR 543 million) and Arsenal (EUR 492 million) leading the way followed by Manchester City (EUR 471 million). It is no coincidence that clubs with a reputation for relative financial prudence, adding Manchester United to Arsenal and Tottenham, have high levels of tangibles as well as cash reserves. Previous Entry State of Play: Sheffield Wednesday – club for sale? Next Entry Commentary Box: Fans Forums – redundant media?